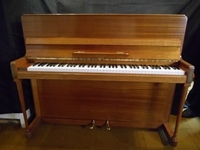 A good quality upright manufactured by the respected Petrof company in Czechoslovakia in the late 1970’s. Finished in an attractive white ‘chalk paint’/limed and waxed effect. 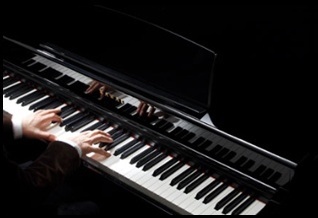 7 1/4 octave keyboard. 3 pedals (1/2 blow, celeste and sustain). Overstrung with a full iron frame, and under damper action. Renovated and offered in good order. 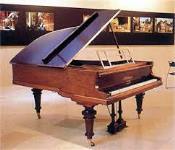 A good upright piano in a dainty, light mahogany case, and of attractive style with spindle columns. 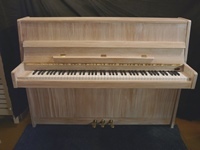 A thoroughly English piano, manufactured in the Brasted factory in London, in 1957. Offered renovated and in good order. Height = 3' 8" Width = 4' 5" Depth = 1' 11"
inclusive of VAT, delivery to ground floor, 1st tuning and 2 year guarantee. A 6’ 3” classic grand piano in a rosewood case, manufactured circa. 1905. Ģ Rebuilt by Bluthner in London about 16 years ago. Re-polished . Aliquot scaling. Bluthner patent action. In exceptional condition.